> A lack of skilled workers in the trades has become a major problem in regional NSW. > Recruiting more women into traditionally male-dominated trades is seen as one solution. > The project gathers industry and government agencies to help remove barriers to women’s recruitment and retention in trades. A lack of skilled workers in traditionally male-dominated trades has become a major problem in regional NSW, and a team of Charles Sturt University (CSU) researchers is investigating how women can help address the problem. 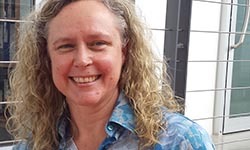 Leader of the CSU research team, Dr Donna Bridges, believes that while there are still barriers for women entering such trades as electrical, carpentry, mechanics and plumbing, some women are able to establish successful careers in the trades. “In our study, we want to establish why these women succeed while others fail,” said Dr Bridges, from the CSU School of Humanities and Social Science. Data from NSW shows that growth of women’s employment in technical and trades occupations in NSW has been slow, from 12 per cent in 1997 to 15 per cent in 2017. “Much growth in women’s employment has been in ‘other trades – including hairdressing, from 34 to 44 per cent in the same period,” said fellow CSU researcher Dr Larissa Bamberry, from the CSU School of Management and Marketing (pictured left). “There have been some increases in women’s employment in animal and horticultural trades, food trades and engineering, information and computer technologies and science technicians. “At the same time there has been no growth in women’s employment in electro-technology and telecommunications trades, construction, or automotive and engineering trades,” Dr Bamberry said. Dr Bridges (pictured left) believes the pressure for change is building to address this problem and in response has developed and is funding a project titled Women in Regional Trades: Understanding Resilience. The project is investigating how to encourage women and girls to enter trades, particularly the positive attributes that help them develop successful careers in regional areas. Initial industry consultations involving up to 15 people are being held across central and southern NSW. These meetings include representatives from industry (mainly employers), employment delivery and education providers, relevant government agencies and tradeswomen. The first consultation was held in Wagga Wagga in April 2018 to discuss issues around social expectations and gender. Participants believed that expectations from parents, peers and career advisors influenced career choices made by girls. “Perceptions are that ‘the trades’ are male jobs and that girls are not strong enough or technical enough to do them,” Dr Bridges said. “Some industry members said that workplace cultures in trade industries need to change and adapt to accept a more diverse workforce. However, it was believed that women can be as successful as men if they have opportunity, support and encouragement. Dr Bridges believes that the real-world experiences of women are vital in understanding more about how women develop strategies to negotiate the world of work in trade industries and how they facilitate their own progress and success. “We want to understand more about the experiences of women’s tradespeople and how they embody and use resilience to remain and succeed in their chosen professions. “We also need to understand how industries manage the integration of women and how their commitment to gender equality translates within workplaces and organisations,’ Dr Bridges concluded. The next industry consultation will be held at the CSU Convention Centre on Thursday 10 May. Contact CSU Media to arrange interviews with Dr Donna Bridges, who is based in Bathurst, or Dr Larissa Bamberry, based in Albury. CSU research team consists of Dr Donna Bridges from CSU School of Humanities and Social Science, and Dr Larissa Bamberry, Dr Branka Krivokapaic-Skoko, and Dr Stacey Jenkins from CSU School of Management and Marketing. The next industry consultation is to be held at the CSU Convention Centre, CSU in Bathurst, Panorama Ave, on Thursday 10 May, starting at 10.30am. Contact CSU Media to arrange interviews. Future research (after industry consultations are concluded) will be interviews with female tradespeople and apprentices on their roles and real-life experiences as tradespeople.